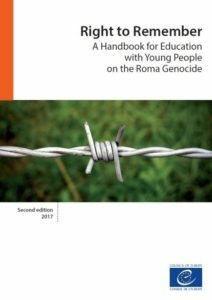 RIGHT TO REMEMBER – HANDBOOK FOR EDUCATION WITH YOUNG PEOPLE ON THE ROMA GENOCIDE – SECOND EDITION IS AVAILABLE NOW! The Youth Department of the Council of Europe within the framework of the Roma Youth Action Plan project has recently made available the second edition of the Right to Remember – Handbook for Education with Youth People on the Roma Genocide. The handbook includes educational activities as well as ideas for commemoration events, and information about the Genocide and its relevance to the situation of the Roma people today. It has been designed primarily for youth workers in non-formal settings, but it will be useful for anyone working in education, including in schools. The second edition of the Right to Remember incorporates revisions into the original publication which was published in 2014. The 16 May 1944 in events of the Second World War is known by the resistance organized by Roma women and man in the “Gypsy Camp” of Auschwitz, when SS Guards made their first attempt to liquidate the whole camp. Roma prisoners armed and barricaded themselves and postponed the liquidation attempt. The 16 May is commemorated by organisations and movements as a Roma Resistance Day. Involving young people, including Roma youth, in researching, discussing and discovering the meanings of the Roma Genocide is a way to involve them as agents and actors in their own understanding of human rights and of history.